Roof racks are one of the best ways to get the most use out of your kayak. After all, what good is having a kayak if you can’t bring it to the water? Kayak trailers can be too heavy for some cars and are quite expensive but the best roof racks can be a much better option. This is because they cost far less, are suitable for almost every vehicle type and are far easier to use. Having the best kayak car rack will ensure that you have every opportunity to use your kayak during the season. This will work to expand your experience and make owning a kayak much more enjoyable. As kayaks have been a favorite water sport for many years now, more and more manufacturers are jumping on board to produce roof racks. This gives you more options and helps you to find the best roof racks for your needs. To help you navigate the market, we have found the 10 best roof racks on today’s market. All of these will work well in transporting your roof rack to the water with ease. Yakima is known as one of the top roof rack and cargo box manufacturers. Their Jaylow kayak roof carrier is also top notch. It can carry kayaks up to 80 lbs in weight on crossbars that are 24 inches or wider. This is one of the lowest maintenance roof racks for cars on the market. With multiple settings, the JayLow allows you to carry one boat in J-Cradle position, two boats in vertical position plus folds down when not in use. This style of roof rack is also one of the more aerodynamic options available. 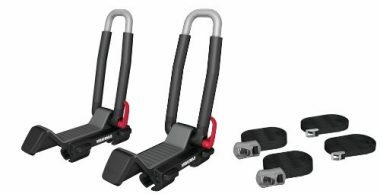 Instead of having a large and clunky strapping system Yakima have developed small tubing that allows the rack to be small enough to offer a lightweight system yet strong enough to carry a heavy load. 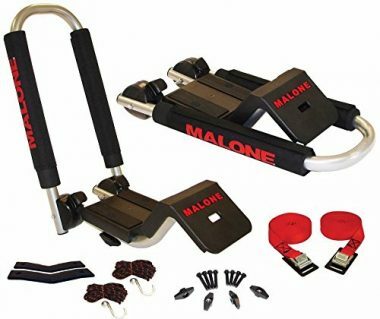 Malones is the best kayak car top carrier and is a great universal system. It comes with all the hardware necessary to get it on your roof and your kayak strapped in and is compatible with nearly every single crossrail variation. The system itself is easy to use. Simply fold the system down and it’s ready for your kayak to be put on. Since the rack is able to fold down you will still be able to fit in your car park or underground parking. You can also rest assured that your kayak won’t get dented or scratched by this roof carrier. It has oversized padding which protects your kayak along the way to the beach. JDM Auto Lights are making a name for themself in the roof carrier market. Their kayak holder for car are made from solid heavy duty steel. This may sound like a heavy setup, but in fact, weighs just under 17 lbs each. But the design can hold some of the heaviest kayaks on the market. In fact, this roof carrier can hold up to 165 lbs. These carriers also have a rust resistant coating on their surface which ensures they stand up to mother nature and whatever else you throw at them. Unlike other manufacturers who send you only a single pair, this company has upped their game. They are sending you everything you need for up to 2 kayaks. The two pairs of these racks will make it easy for you to transport every watersport toy your family has. Thule has been around since 1942 which gives them more knowledge than nearly every other roof rack manufacturer on the market. Their experience have shown them the most sought after features on the market. This setup has a PFD lever, which stands for pull, fold done. It really is that easy to get this up and running. When this is combined with two ratchet system and straps all you need to do is install this roof rack and you’ll be on the water in no time. And the fact that you don’t even need tools to install makes this one of the best systems on the market. The roof rack itself is made from steel rust resistant tubing that has been designed to be extra strong. There are two perfectly placed tick pads which ensure your kayak is not only away from anything that can scratch it, but also held in the position you placed it in. Thule has even included pockets that you can put the extra straps so they don’t blow in the wind. This is best rooftop kayak carrier that can hold a kayak up to 34 inches wide and up to 75 lbs heavy. This covers a lot of the kayaks on the market. 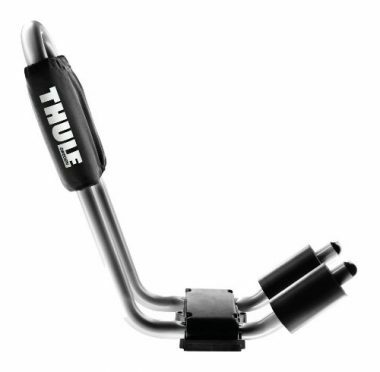 Thule is such a great company that they also include a limited lifetime warranty. You won’t be having to replace this roof rack in a year when a piece breaks. 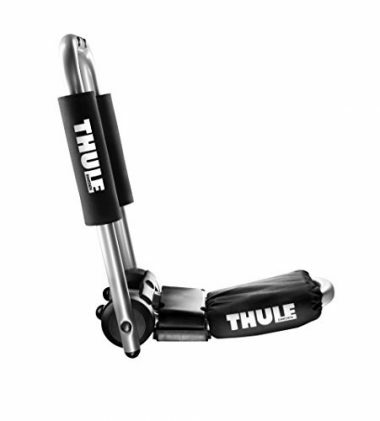 Simply contact Thule with your issue and they will work their hardest to remedy the issue. This is a rack for cars without rails. Instead of being fastened to your vehicles rail system this rack simply loops around your roof. It uses two inflatable pockets that allow you to strap your kayak to transport it. But these will allow you to transport more than just a kayak. In fact, you can transport everything from furniture to canoes. This system is made with a tough and durable 420 D nylon. It inflates in minutes with a double action Handi Pump. There are also 5 D-ring anchor points that you can connect the straps securing your kayak to your car. The amazing part about this carrier is its weight capacity of 180 lbs. This is near the top limit of what a kayak roof carrier can hold. If you are worried about it being an inflatable, Malone also includes a 1 year warranty. The SeaWing Saddle Kayak Carrier from Malone is a great option for people looking to reduce their overall weight. These are low profile carriers that take up only a small amount of space on your roof. 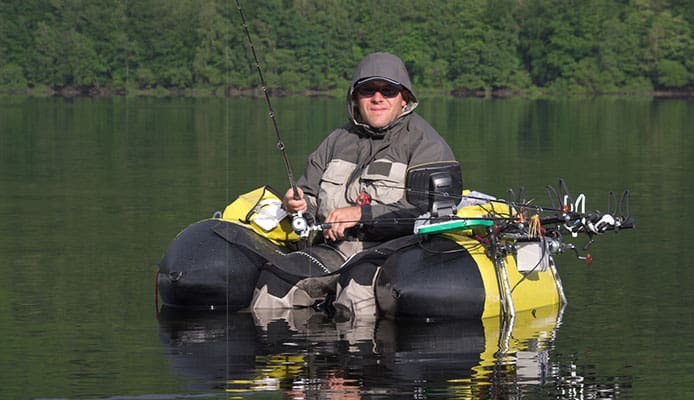 The strap system is one of the easiest to use on the market and essentially involves looping the strap around two points and up and over the kayak. The cradles will then slightly flex ensuring a tight bond between the rack and the kayak. This will also reduce wind resistance and gas mileage. There is also no tools required to install this setup. It comes with everything you need to toss it on your roof in minutes. The rack is also made from a corrosion-free polycarbon material for the frame and a synthetic rubber for the padding. Since your kayak will be resting on the ribbed rubber it won’t slide around at all. Yakima is one of the best companies when it comes to any kind of roof rack systems. Their best kayak carrier for cars is also top of the line. The Showboat comes with a pair of carriers so that you can bring along all your kayaks. Yakimas attachment system will fit almost any crossbar system including round and square setups. You won’t need an extra attachment package with this roof rack. The pads are also on the large size. They will more than keep your kayak safe and secure no matter how bumpy the road is. They also include load assist roller slides which make loading and unloading your boats a breeze. Yakima is also the leader in the industry when it comes to warranties. Their Love it ‘Till You Leave It limited lifetime warranty is one of the best in the business. Thule is a trusted name that is known for delivering high quality products that outdoor enthusiasts can trust. These kayak carriers are no exception. With a durable steel design that features a rust-resistant coating you can rest assured that this will last you many years to come. The carrier features a foam padding that provides superior protection for your kayak. Superior carrying performance this roof rack allows you to carry one solo kayak or use another set and fit 2 carriers per vehicle. This rack has a wide mouth design with a J style profile that makes it easy to get your kayak on and off your car. This also works to take up minimal space on your roof allowing you to tow along even more. Coming with everything you need to install, you can quickly add and remove this carrier when needed. Accommodating kayaks up to 75 pounds this is an exceptional choice for most kayaks. No longer do you have to struggle to attach your bow and stern lines to your car. 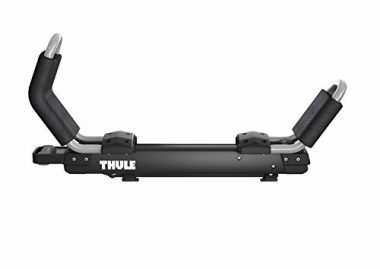 Thule have an ingenious QuickDraw system that protects your cars bumper while ensuring your boat is securely fastened. This is one of the most ingenious kayak carrier roof racks on our list. It features a complete sliding system that can accommodate any size kayak with a width up to 36 inches and a maximum weight of 75 lbs. This is done by having a sliding roller on the end of the frame which can move to the ideal position which allows different sized kayaks to fit on the same roof rack. It also helps you load and unload your kayak. All you have to do is simply extend the bar and it will take 50% of your kayak's weight. The body of this system is double coated corrosion resistant steel which allows it to stand up to salty conditions and mother nature alike. There are also 4 connection points where you can attach your best kayak rack to. 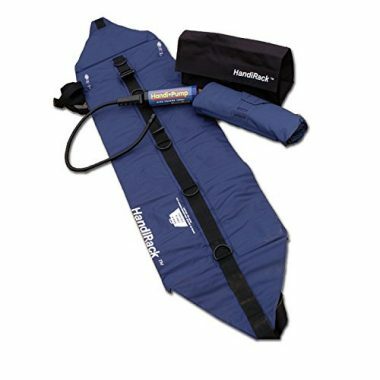 This disperses the pressure from the straps ensuring your kayaks form isn’t affected. The best part is that these straps are included in the package. When you are looking for roof racks that work to make transporting your kayak easy then you will need to pay attention to a few key features. Brand recognition plagues every market; in a good way and a bad way. Some companies are built on their brand, and some brands are built on the quality of the product. When you are searching through all of the brands for the best dual kayak roof rack, you need tube careful. The branding may be spot on or a company, but does the brand stand behind a great product, which you can trust? There are some brands which guarantee you quality in the roof rack realms (though you can never be quite sure if the best double kayak rack is going to be perfect for you). When you think of brands such as Thule, Rhino-Rack, ROLA, and Malone Auto Racks, you think about quality. Look to the bigger brands for quality and features at a low price. One thing we always look for are brands which are specialized. If you can find a brand which only manufactures a double kayak roof rack, then you know that their focus is on that particular product. Brands which spread themselves too thin, do not have the same focus and drive when it comes to one particular product. Look for a brand which is either solely focused on the best kayak roof racks, or is based in that field. You may find a brand which makes kayak racks for all sporting equipment, or you may find a company which manufactures all things to do with kayaks. As always, always check the reviews of the brand and the product. 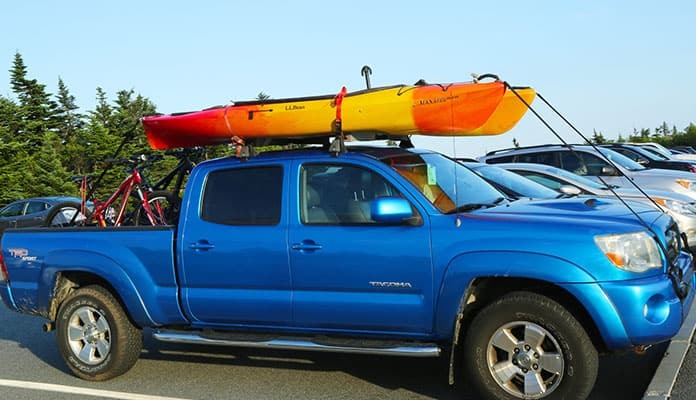 If you are in the market for the best kayak rack for a truck, then it should be able to transport your kayak on your vehicle. There is no point in buying a roof rack which has not been designed to carry a kayak. You may find a roof rack which will carry other sporting goods, but not specifically a kayak, and try to make it fit. If you have a roof rack which is not designed to carry a kayak, then you can have real problems with it, which could lead to you damaging your vehicle. The same goes for finding a kayak carrier for your car. If the kayak rack is not suitable for your vehicle, then you shouldn’t try and make it fit. If you try and rig a kayak rack to your vehicle, you may end up damaging your vehicle and your kayak. 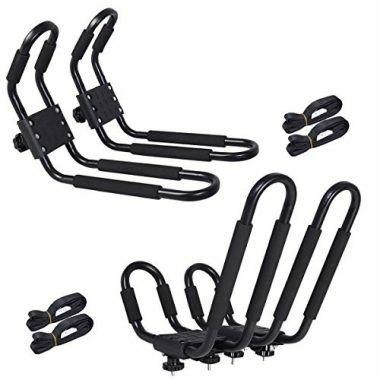 You should think about the additional features of the kayak rack when you are deciding which one to buy. Is the kayak rack going to be permanently attached to your roof? If it is, then most of the time it is going to be empty, unless you are going to go kayaking everyday. If the rack is there permanently, then it should look good. 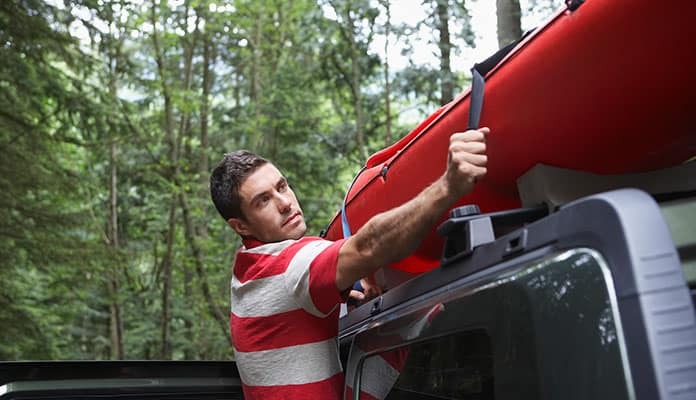 You should also look for features like folding bars, so that you can fold the kayak rack down and not have it permanently sticking up from your roof. This also helps if you have a garage to park in, or a building with a low roof. You are able to get in and out without damaging the rack or the building. If it is not going to stay on yup vehicle permanently, then it should be easy to remove. There is no point getting a rack which takes a long time to attach and detach or you are going to be discouraged from going out in your kayak as much. In fact, one of your main consideration, if you need to remove the rack often, should be how quickly you can take the rack off and put it back on. Obviously, you will also have to buy a rack which is designed to accommodate the size of your kayak, the type of kayak carrier, and the number of kayaks you want to transport. Price is an obvious issue when you are buying any product, but can be more so when you are buying a product to be used with another product. 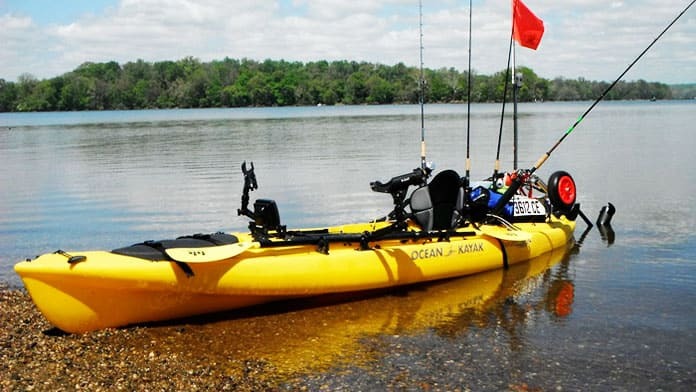 The best kayak is a product you will spend a lot of money on, but often not a lot of thought is put into kayak accessories, such as a kayak rack. When it comes time to buy a kayak rack, it is tempting to spend as little as possible, after buying the best kayak. But, you should always remember, that you get what you pay for. When it comes time to buy your kayak rack, you should understand that the kayak rack is an investment. If you go out and buy the cheapest rack possible, then you are likely going to be paying more money in the long run. A cheap rack can damage your car. The fasteners and joins are not as high-quality. This can lead to your car being scratched up and dented. Cheaper kayak roof racks are also less durable. If you invest in a high-quality roof rack, it will last a long time. A cheap roof rack will wear down over time. The materials are not as good and will need to be replaced before long. You do not want to have to spend money to fix your rack, replace parts, or, in a worst-case scenario, buy a new rack altogether. A cheap kayak rack will almost certainly damage your kayak carrier for a suv. Less focus on design and materials means that the rack will be hep with sub-standard fasteners. Just as it can damage your car, a cheap rack can damage your board too. Cheaper materials are also weaker, and there is the chance that the fasteners can come loose as you are driving, sending the board out onto the road. Spending more also means access to more features. Depending on your needs, you may have to spend a little more than you are comfortable with to fit a specific car or board. You may need arms which fold down or a quick-release system. We always recommend starting with a high number in mind. Find the features you need, and then shop within that. If you shop around, you can still get a good deal on a kayak rack. It is our pleasure to take away some of the hard work and present the most affordable best kayak roof racks on the market. Your car is a big factor when you are choosing the best kayak mount. There are two main things to consider. Firstly, are there any kayak racks out there which are compatible with your vehicle? If there are not, then there is no point in buying a rod rack or a kayak. There is a good chance that there is the best kayak holder for cars out there which is compatible. If that is the case, then you can shop within that group and move onto the second question. Once you have found the roof racks which fit your vehicle, you need to make sure that they fit your kayak or kayaks. The first thing you should be looking at is the number of kayaks which you need to transport. There is no point in getting a roof rack which transports a single kayak when you will always need to transport two. On the other hand, there is no point in getting a roof rack which can hold four kayaks, when you only have one. That would be a waste of space, and would probably take more time to get on and off. You should also be looking at the size of your kayaks. You need to find a kayak rack which can accommodate that size of the kayak. At the very least, you want a kayak rack which can be adjusted. The final thing to think about is your safety. 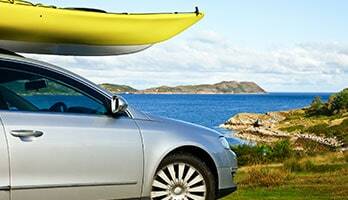 If you find a compatible roof rack, which can transport 5 of your kayaks, is it safe? Do you feel comfortable driving with the rack on your car? Does it hold the kayaks? Is your vehicle safe from harm? The towers are integral to the roof rack, and a lot of the strength of the rack will come from here. They bear the weight of the bars, and the kayaks, and need to be attached to the strongest part of your roof. This is why you should never buy a rack which is not compatible with your vehicle. If the towers are in the wrong place, then the integrity of the entire rack is compromised. When you are looking at the towers of the rack, you should be looking for high-quality materials. They should also come with high-quality fasteners. The towers need to be fastened to the roof of your vehicle, and even if the towers themselves are of the highest quality, the movement of your car will break cheap fasteners and your kayaks will come untethered. Most towers will come with a fastening kit which has been specifically developed to fit with the towers. Two things we like to look for are non-abrasive materials and locks. If Your towers come with some sort of rubber or silicone on the bottom, then they can be tightened a lot to fasten them to the roof, give a strong hold, and not scratch your roof. The same is true for when you are in transit. The most secure towers are going to move very slightly. If metal were in contact with metal, then it would be worn down over time, damaging your car, and leaving more of a gap for the rack to move and come loose. We also like towers which are lockable. Most towers are securely fastened, and there is little chance that someone will come along and try to steal the rack, but it has happened. Even though someone would need tools and some time to unfasten a roof rack, people have been known to do such things. With a lockable tower, you know that your roof rack is safe. Someone cannot just come along and steal your rack. The bars are what will hold your kayaks. Usually, you have 4 towers and 2 bars. The towers fit onto the roof of your car, close to each corner of the roof. The bars then sit across your car horizontally. 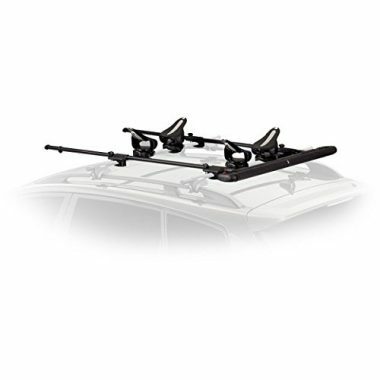 There are some things to think about when you are choosing your roof rack system. One of the most important things is how they are fastened to your towers. They should be easy to fit, but they should fit securely. Once they are on the towers, there should be minimal movement, or your kayaks can shift and come loose. Just like when you fit the towers to your roof, ether should be no bare metal on metal when you fasten the bars to the towers. There should not be materials which can run and wear down. It goes without saying that you should look for bars made of high-quality materials, but you should also make sure that you buy bars which are strong enough to hold your equipment. A lot of the best kayak roof racks can be used for other water sports equipment, such as canoes and paddleboards, so you should make sure that the kayak rack is strong enough to hold your heaviest items. They should also be long enough to stretch from one tower to the other. The separate bars make it easy to adjust your system. You can get all-in-one systems, but they are harder to fit and might need some custom work. The last thing to think about is how your kayaks are fastened to the bars. You should not skimp on finding fasteners which will hold your kayaks securely and will also hold them safely. You want to find fasteners which are strong and durable. Fasteners which will not be affected by the sun or the salt water, but also fasteners which will not damage your kayaks. They should hold them tight, but the material should also be soft. This choice depends on whether your vehicle has built in roof racks and bars. If so, this makes transporting your kayak simple and only requires some foam pads and a strap. For vehicles that do not have this pre-built feature, you will require a more complicated setup. You will need to install roof racks to your car so that you can safely transport your kayak. Foam Roof Rack or Carriers? Foam roof racks provide a cost effective solution to transporting your kayak for those that do not have a roof rack. This provides a safe and secure way of hooking your kayak up and is also quite easy to use. These are a great method to use for those only looking to transport one kayak at a time. For those with multiple kayaks, you will require a more complex system. Roof racks are a great option for those looking to transport multiple kayaks at the same time. If your car has built in rails then adding the best kayak rack is a great option. These are so desirable as they are incredibly secure and allow you to transport multiple kayaks or tandem kayaks at the same time. All you have to do is secure your kayak in place and then strap down accordingly. Some roof racks have built in locking systems to make this even easier. One thing to consider for this form of transport is the extra height that it adds to your vehicle. This height can be restricting in garages and other areas. Can I Add Rails to My Car? Yes, but you will need tools and a lot of skill in order to safely do so. It is best to get this installed for you as any errors can end up costing you a lot of money. For those not wanting to drill rails to their car there are aftermarket rails that can be installed without doing so. These roof rail and rack mounting systems are designed to clip on to the rain guard or the window lip of your car. They are modular and removable but come with the drawback that some will impede you from opening doors once the rack is mounted in place. These can be viable options for cars without a built-in roof rail but I can tell you it’s definitely annoying to have straps holding your doors and windows closed. Foam pad roofs are the easiest to install. You will want to start by putting the foam pads on the roof with the flat side down. Then, place your sit on top kayaks on top and attach the straps to your kayak and then to your vehicle. Take extra precautions to ensure these don’t scratch your vehicle using the foam to protect your car. Roof rails are slightly more complicated as you will need to find racks that will fit your rails. Strap your kayaks in place using straps or the built in locking systems. Tug on the straps to ensure that everything is in place before driving. Roof carriers are a great way to transport one or two kayaks such as ocean kayak and ocean fishing kayak at a time. As you have limited roof space, you will not be able to transport more than this. For those looking to transport more kayaks, you will need to add a trailer, side mount or a hitch mount in order to accommodate that many kayaks. You should be able to have enough space for up to 5 kayaks if you have the right equipment. Q: How To Tie Down A Kayak On a Roof Rack? A: Kayak roof racks will typically come with a specific tie down system. Most companies have specified where the anchor points are for their carrier. Most of the time they will simply loop around the body of the kayak. But no matter which rack system you decide on you will have to ensure they are strapped to the front and rear of your car. This can be done by simply tieing off the bow and stern to the tow hooks situated under or in the bumper of most cars. It shouldn’t take much to find these points and add a line of rope securing your kayak even further. Q: How To Load a Kayak Onto a Roof Rack? A: Loading your kayak onto your roof sounds like a daunting task, but it honestly isn’t. Most companies include some sort of lift assist with their systems. This can be a bar that slides out which takes the weight of your kayak off your body. You can then slide the arm back into the position and securely fasten your kayak to the roof. If your roof rack doesn’t have this built in feature you will have to lift it onto the roof rack system. Before you do this you will want to ensure your kayak is emptied of all your gear and any water that has accumulated. This will lighten it and make it easier to load. Once it’s on top simply follow the strapping instructions included in the package. Q: How To Install a Kayak Car Rack? A: Roof rack companies make this incredibly easy. Most of the time installing your new roof rack doesn’t even require tools. You simply have to screw it onto the existing cross bars on your car. Q: Can I mount A kayak To A Small Car? A: The question is not, can I mount a kayak to a small car? The question is, how small a car can I mount a kayak too? The truth is, that there really is not car too small to not be able to fit a kayak, in our opinion. It is true that the smaller the car you have, the harder it will be to find a rack, and the more limited your choice will become, but you should still be able to find a rack which will work. Most companies manufacture racks for the masses. This means making a rack which will fit as many cars as possible. The smaller your car (or bigger your car), the more limited your choice becomes. If your car is extremely small, then you may have to pay for a custom rack, which is manufactured specifically for your car. Kayak technology has evolved over the past few years, and kayaks are becoming lighter and lighter, while also becoming stronger. You do not need to worry about your car being too small to carry the weight. If you can carry a kayak by yourself, then your car can carry one too, no matter what the size. Q: Can I Fit More Than Two Kayaks On My Car? A: Yes, and no. Most racks will accommodate two kayaks. 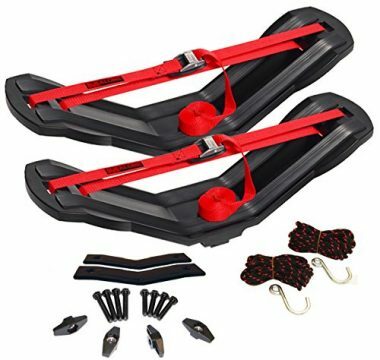 They will come with fasteners to fit these two kayaks, and you cannot generally buy more fasteners to increase the capacity of your roof rack, though I am sure that you can get replacement fasteners. If you do want to add more kayaks to your roof rack, then you can rig it up to do so, but then you are liable for any damage on the kayaks between your home and the water. To fit more kayaks on the rack, you first need to fir two kayaks with the included fasteners. Once they are on, you can squeeze two more kayaks in the middle of the original two, and fasten them. 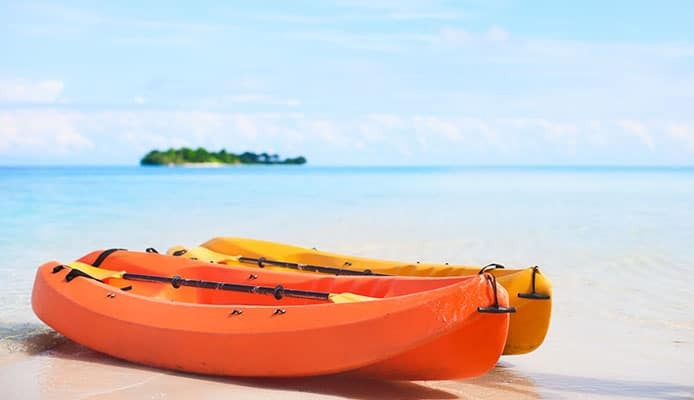 You should take the time to make sure that the additional kayaks are fastened correctly and securely, or you will have them flying off before you get to your destination. If you are attaching more than two kayaks to your roof rack, then you need to drive slower than usual. We do not recommend driving on the highways unless you want to lose a kayak. We would always recommend following the capacity guidelines for your kayak rack, as that is the only way to guarantee safe transport, but we also recognize that there are times when you need to transport more than two kayaks. Q: Is Transporting A Kayak Safe? A: Completely. Transporting a kayak is completely safe. If it wasn’t, then there would be a lot fewer kayakers in the water. There needs to be a way to get kayaks from storage to the water, and the best kayak roof carrier is the most secure way of doing that. Of course, accidents can happen, but if you follow the installation guide correctly, and follow the instructions for securing your kayaks, then you will give yourself the best chance of getting your kayaks to the water unharmed. Before buying your kayak, it is important to consider how you are going to transport your kayak from your house to the water. This is important as it will ensure that you get the most use out of your kayak. One of the easiest ways to transport your kayak is by having the best kayak roof rack. All of the ones on our list are made by trusted companies and will do a great job of keeping your boat safe and secure during transport. Do you have one of the kayak roof racks from our list installed on our car? Tell us how they have worked for you in the comment section below.